Four persons take away leaves, branches and layers of soil. All material is put into numbered white bags and then carried away, out of the forest. At sunset (21.23 hrs) the forest is deserted. 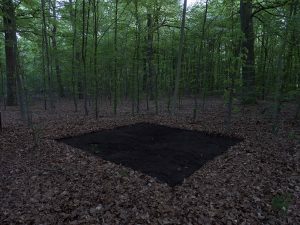 An empty dark square between the trees. At sunrise (05.48 hrs) the four persons return, carrying white bags. They start filling the empty square with material from the bags, but in reversed order. The last bags contain the top layer: the leaves and branches. Using photographic prints as a reference, the square is restored to its original shape. The work Nachtplaats was carried out on 12 and 13 May 2016 at Buitenplaats Koningsweg, Arnhem, the Netherlands. The performers were Yvo van der Vat, Anke Van Den Brink, Jeroen Glas, Sibylle Eimermacher, Marcel Daelmans, Oscar Lourens and Frans van Lent. The process has been documented on video. This entry was posted in Installations, Performances on 15/05/2016 by Frans.